I am looking for a solution (Script or Automator) to convert everything within a certain folder to one PDF file. Does someone know with which tool I could accomplish that? The standard PDF automator possibilities do not work… pictures-to-pdf. And I tried to use Abby Fine Reader, but the automator works just for single files, and I cannot find a possibility to combine them. Does PDFpenPro has this possibility? Or Adobe Acrobat? Or is there a shell-script program I could use? … I am stuck… Thank you in advance! Rather than thinking about this as one problem, have you tried breaking it down? For example, I would imagine an approach like this could work. Find something to convert one image to a PDF. Find something to convert one text file to a PDF. Find something to trigger an automation against a file. e.g. a shell script checking the file extension and then running a command line instruction. Find something that can trigger against multiple files. e.g. a shell script can loop over multiple files. Find something to combine multiple PDF files into one. So an update Thank you sylumer – that is now exactly what I am doing! 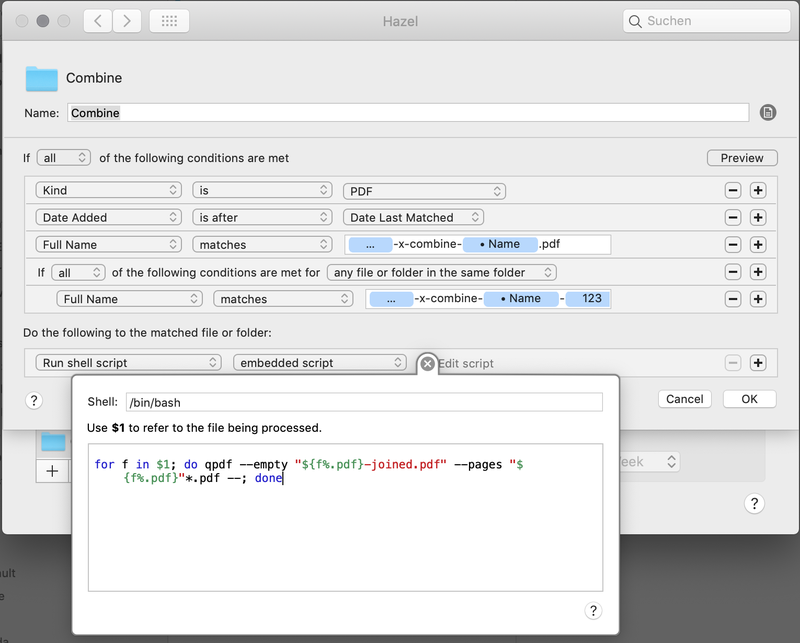 Converting the files to PDFs is no problem with automator and calibre. When all documents are pdfs I merge them with qPDF! Thanks for the hint! Vidman2019 helped me on mauser.de, here, with the script. That works if the files are named original-file.pdf, original-file-1.pdf. original-file-2.pdf etc. where original-file is any filename.